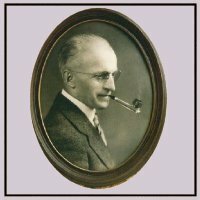 It is by no means merely puffery to say that Professor Frederick K. Kirsten was a genuine American original. He first sailed to this country in 1902, as a cabin boy from Hamburg, Germany. After successfully rounding the Horn and eluding the shanghai gangs of the West Coast, he navigated the educational system at the University of Washington to become a Professor of Aeronautical Engineering. Here, his inventive spirit took wing. He created the world-famous Kirsten Wind Tunnel, Air-washing equipment for factories, an air-cooled Utopian Bed, and, most notably, a revolutionary propeller which enables boats to stop and turn on a dime. Today, in the same waters where he jumped ship almost 100 years ago, ocean-going vessels are landed by sturdy tugs driven by Kirsten cycloidal propellers, piloted by equally sturdy captains smoking cool Kirsten pipes. 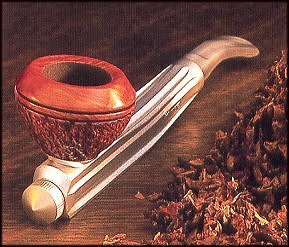 Rightly called the coolest pipe in the world, this latter innovation came about when a doctor advised Professor Kirsten to switch from cigarettes. He quickly dreamed up a way to trap the moisture, tars and tongue-biting acids which attack the users of briar pipes. After 80 years and counting, Kirsten pipes are still produced by the Kirsten family, faithfully following the basic designs of this father of invention. Every KIRSTEN item is made from the highest quality materials by skilled craftsmen. Each item has been thoroughly tested in our laboratories and is guaranteed free from defects and as represented in our catalog. Order from KIRSTEN with complete confidence that you will receive the best all-round value available in smoking equipment. We guarantee satisfaction. Upon receipt of the merchandise, examine it carefully. If it does not measure up to your expectations or is unsatisfactory in any way, we will exchange your purchase or refund your money promptly. We want you to be completely satisfied with everything you buy from KIRSTEN.